This is an astounding first novel. Based on a short story which the author has expanded, and set in France during the First World War, it tells of Angelique and her belief that her brother Pascal will return from the First World War trenches, to take over the family farm. She is determined to keep the farm and the herd of geese he loves so much safe for him. When her violent father dies at the front, she discovers that he had mortgaged the farm to pay for his drinking and gambling, and makes the difficult decision to raise the money to buy it back by taking the geese to the north of France to sell to the highest bidder. Dressed as her brother and accompanied by her Uncle Gustav, Angelique makes the perilous journey with her precious geese and the gosling, Amandine, she had raised to lead them. From the very first page, the reader is in a small rural village in France, with its group of widows in black, and immersed in Angelique’s difficulties when she cannot in all conscience be sad that her violent father is dead. Gradually through the story Angelique learns of the family history, that violence begets violence, and comes to understand why her mother still loves and misses her father. The scenes where she meets Gustav’s wife, her father’s sister and comes to see her childhood through different eyes are particularly well done. Angelique’s journey through war-torn France to Etaples is harrowing. The reader feels the cold and the hunger. In Etaples she encounters British as well as French soldiers and sees the effect the war has on them, and in a hotel bar she sells her geese driven by her need for the money to pay the debt in an uncharacteristic tour de force. 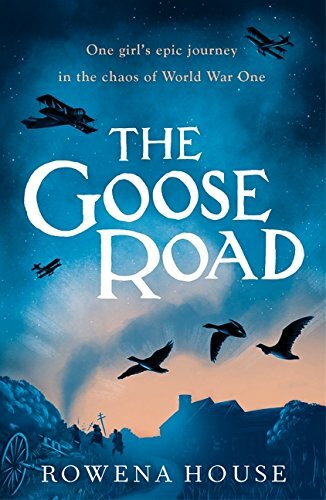 This is an extraordinary novel, one this reader could not put down, a story of courage and love of one’s country and family, and of the geese, especially Napoleon Bonaparte! There are questions about the reasons for the geese dying, which sparked the original story, and may have been the origins of the Spanish influenza which killed so many, but in the end it is about so much more than that.